On Monday, August 20, Cross River held its Ninth Annual Golf and Tennis Outing to Benefit Madraigos at Trump National Golf Club in Westchester. Known for its challenging course, spectacular grounds, and majestic waterfall on the 13th green, it proved to be the perfect backdrop for a beautiful day of golf, tennis, and networking. Madraigos was thrilled to be selected once again by Cross River and its board of directors to be the sole beneficiary of this most successful outing. Madraigos owes a sincere debt of gratitude to Cross River Bank for their extreme generosity and genuine vote of confidence. “It was a pleasure to participate in helping such a wonderful and worthy cause that benefits so many individuals. Events like this reinforce how important it is to give to others,” said Shimon Eisikowicz, executive vice president, chief lending officer, Cross River. Madraigos also has profound gratitude to all those who generously participated in the outing. Major event sponsors included Harborview Capital Partners, Goldman Sachs, Deloitte, Greensky, Davis Polk, PWC, Affirm, SRx, Exigent Capital Management, Grand Healthcare, Best Egg, Freedom Financial, Gourmet Glatt, Sunlight Financial, Hunton Andrews Kurth LLP, Wachtel Missry, Republic Valuations, Liberty One, Martin and Melodie Scharf, and Singer Environmental, to name a few. Guests began arriving well before 9 a.m., as many people were eager to use the grounds, tour the clubhouse, and enjoy the generous giveaways that Cross River presented to each registered golfer and tennis player. The Premium Giveaway, the Ultimate Ears Blast Portable Speaker with Alexa, sponsored by Grand Healthcare and the golf umbrella, sponsored by Davis Polk, were extremely well-received. The participants were given a Deloitte gym bag filled with valuable items, including a gift certificate for the Trump National Golf Club Pro Shop. As a new event enhancement, golfers were also treated to premium golf gloves, sponsored by The Battery Group. Custom sized for each golfer, this accessory item brought cheers of excitement, sure to be used again and again. Exigent Capital Management sponsored the Vpar live golf scoring, a cutting edge feature which ensured accuracy in scoring and displayed action photos and live stats throughout the day. Golfers enjoyed the handheld devices and viewing their foursome photos on the large TV leader boards at the golf club. Following a lavish breakfast sponsored by Wachtel Missry, the 36 foursomes began to prepare for a competitive day of golf. Many of the event participants expressed their enthusiasm for the scenic golf course, with its world-class manicured greens, and particularly to come out in support of such a vital cause for the community. 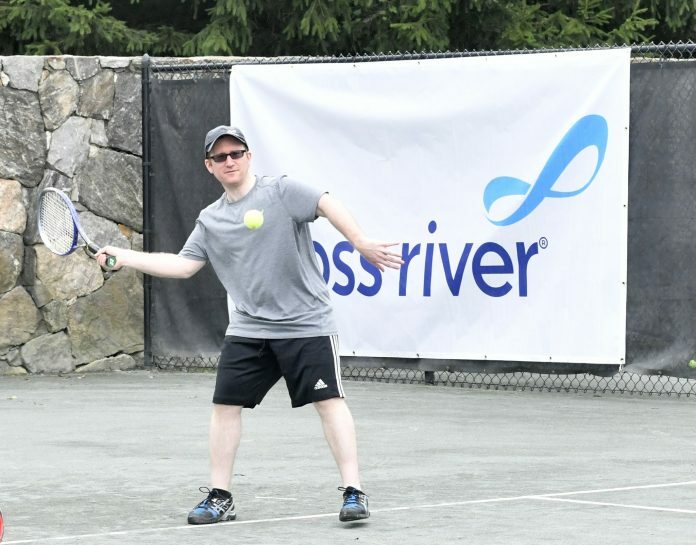 “We are grateful to our client Cross River Bank for hosting another superb outing to benefit Madraigos, and we admire and applaud Cross River for its continued focus on giving back to the community. The event was spectacular, and we were once again proud to participate and to support this most worthwhile cause,” said Silver Level Event Sponsor Michael Steinberg, Davis Polk, and Wardwell, LLP. The BBQ lunch, sponsored by Goldman Sachs and GreenSky, featured a charcuterie board of specialty meats, as well as delicious lamb chops and gourmet foie gras. Thanks to event sponsor, Hunton Andrews Kurth LLP, participants were also treated to a smoothie station, Urban Pops, and a comfortable sitting area with a chair massage station nearby. Beautiful music by Eli Levin and his band enriched the scene for participants and guests savoring the beautiful course. More than 150 additional people joined for the cocktail reception which was sponsored by SRx. Elegant tables were set to accommodate the 300 people who had come together to ‘network for a cause’, meet business leaders, and mingle with entrepreneurs from all over the country. The grand finale was the dinner reception, sponsored by Harborview Capital Partners. Phil Goldfeder, director of government relations, Cross River, former NYS Assemblyman, and long-time friend of Madraigos, emceed the short dinner program. Golf and tennis trophies were presented and wonderful raffle prizes were distributed. The grand raffle drawing attracted the most attention and excitement as it featured two premier tickets each to the US Open and Harry Potter on Broadway. Other special raffle prizes included vacations at the oceanfront Casa de Campo Resort/Spa in beautiful southeastern Dominican Republic, an Andrew Lock custom suit, gift certificates for foursomes at Trump National Golf Clubs in Westchester, Hudson Valley, and Bedminster, a Dell laptop, 50” Samsung TV, a one-year Wine Club membership, sponsored by Atlantic Beach Wines, and 20,000 Jet Blue points. The biggest highlight of this year’s outing was the upscale catering provided by Heavenly Events. Under the direction of Jacob Abraham, the team worked tirelessly to provide tasty, gourmet, and beautifully presented dishes throughout the day. Madraigos expresses its appreciation to Mark Glicksman, events and projects coordinator at Cross River, for sharing his expertise in event planning and event management. He worked closely with the caterer and other vendors to bring the event to the next level. Glicksman’s untiring dedication to uphold the high standard of the event while maximizing the financial benefit to Madraigos was exemplary. “We appreciate our generous sponsors and everyone who came here today to network for a cause while supporting Madraigos. We could not provide our life-saving work were it not for each and every person here today,” said Rivka Lock, director of development at Madraigos. Funds raised at the event will assist Madraigos in providing valuable prevention and intervention services to the Five Towns/Queens community and beyond, including a support line, community education, crisis intervention, case management, assessments and referrals, school-based services, The Lounge, Ignight, Parenting Matters, shabbatonim, job placement program, support groups, and yom tov retreats, including this year’s inspirational Rosh Hashanah program which will take place at Hudson Valley Resort in the Catskills. For more information about the 9th Annual Cross River Golf and Tennis Outing to benefit Madraigos, visit ForeThem.org. For information about Madraigos, please visit Madraigos.org.